For a long time now I've been interested in Degustabox after hearing about it a lot on twitter and various blogs but I have to say I haven't ever been truly convinced by it until last month. There are a lot of similar boxes around and they always tend to be pretty hit and miss which has stopped me several times from hitting the order button. I can be a pretty fussy eater sometimes so I was worried I'd get a box full of foods that I don't like! Luckily though this most definitely did not happen when my box arrived at the end of last month, I was very pleasantly surprised. The first thing that I spotted when I opened up the very well packaged box was a handy piece of card that listed all of the goodies inside my box, I did very quickly turn it over though so I didn't ruin the surprise! 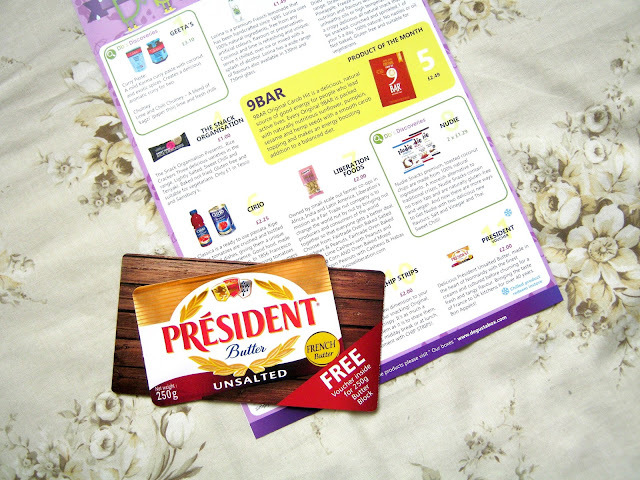 Also inside was a voucher for a free block of butter which has come in very handy for baking, on the back of the info sheet there is a recipe for chocolate fondants that needs a block of butter so they go hand in hand very nicely, I thought that was a lovely little touch. 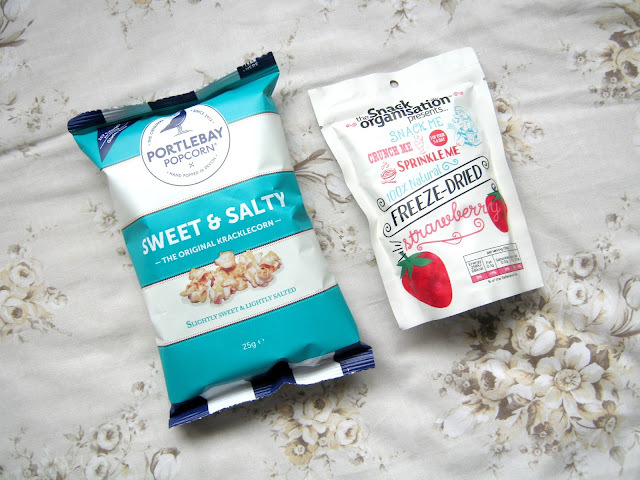 There was bound to be at least one thing in the box that I wouldn't like and this Portlebay Popcorn was that one item! My brother however is a massive popcorn fan so I passed them over to him and I'm pretty sure the bag was finished within a minute or two so I reckon that's a thumbs up from him! It was a completely different story when it came to The Snack Organisation Freeze Dried Strawberries (£1) though, I was very certain that I would love them and I was 100% right. These have become my favourite snack since arriving in my October Degustabox, they are really sweet but are so much better for you compared to a chocolate bar. I haven't managed to find them in store yet but I know when I do I'll be stocking up and maybe trying a few other flavours. 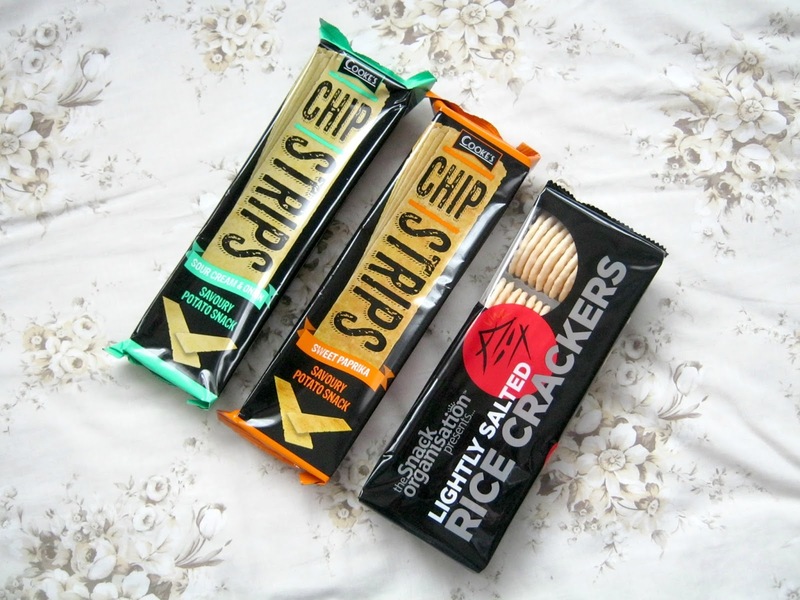 I'm a pretty big crisp eater so I was more than happy to find these Chip Strips (£2) in the box, they immediately reminded me of Pringles when I opened them, just in a different shape! I really enjoyed the Sour Cream & Chive flavour but found the Sweet Paprika flavour to be a little too strong for my liking. I can't say 100% that I'll be buying these on my next stop at the shops but I did really enjoy how light and crips they were. Nestled just underneath them I found these The Snack Organisation Light Salted Rice Crackers (£1) which both me and my Mum really liked the look of. My Mum especially is a big lover of rice crackers so between the 2 of us these disappeared quite quickly. At only £1 I know I'll for sure be picking these up in the supermarket. 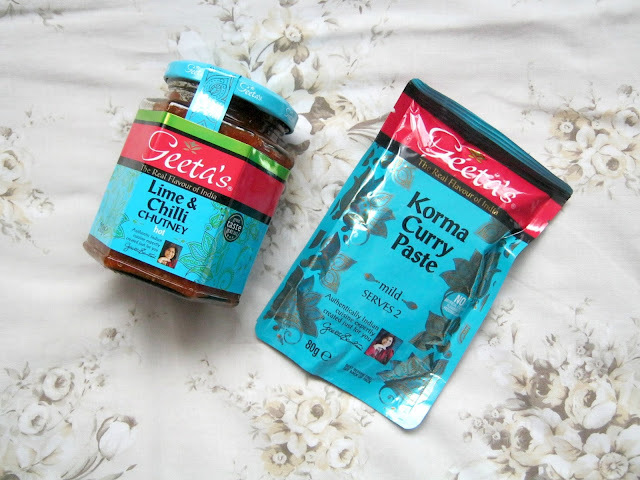 I thought I'd talk about a product next that complimened the rice crackers really well, the Geeta's Lime and Chilli Chutney (£2.09). Me and my Mum spent a good part of one afternoon dipping the rice crackers into the chutney and disocvering that they made an amazing combination. The chutney is very spicy so you really don't need much but I know this will go well with so many things and will last a while. Another Geeta's product that came in the box was a sachet for 2 of the Korma Curry Paste (99p). I love spicy curries so I know that this will definitely get used up, I haven't tried it yet but I'm really looking forward to making up a lovely chicken curry with it. When it comes to snacks I'm definitely a M&Ms and Doritos kind of girl, as much as I love fruit you won't often find me replying to emails while snacking on an apple! 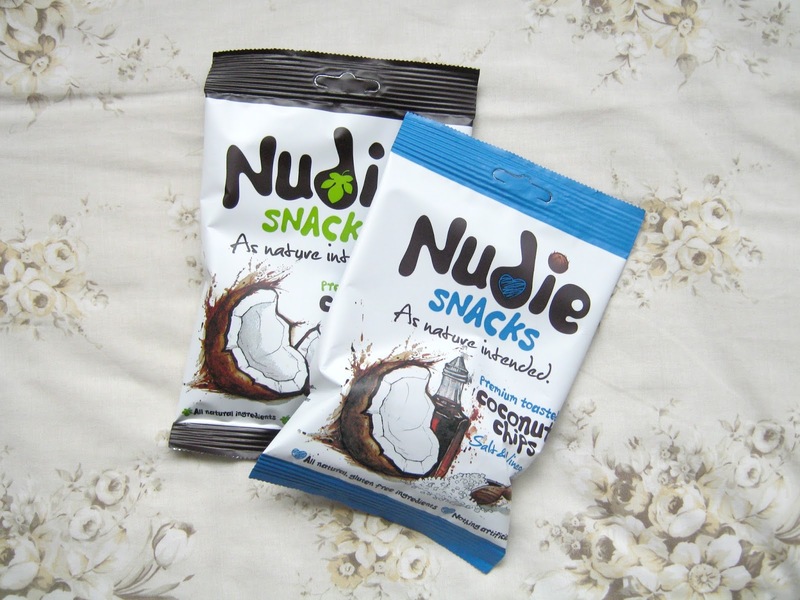 I have been trying to cut down on sugary snacks though so I was very happy to find these Nudie Snacks Coconut Chips (£1.29) at the bottom of the box. I wasn't particularly impressed by the Salt & Vinegar flavoured ones but I did enjoy the original ones, they don't have tons of flavour but they make a very good afternoon snack! 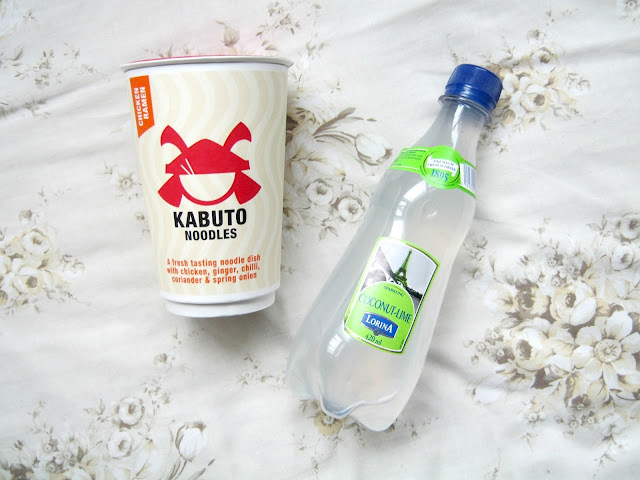 This next product has to be my favourite out of everything, the Kabuto Noodles Chicken Ramen (£1.99) is everything that I want out of a lunch. This is a massive jump up from your standard pot noodles, the noodles are really thin and packed full of flavour. I've bought myself a couple of these since trying the one from my box as at £1.99 it is cheaper than if I were to buy myself a meal deal lunch at a supermarket! If you're looking for something a little different for lunch and want something warm then I'd definitely take a look at these. Unfortunately things didn't work out quite so well for the Lorina Coconut and Lime Drink (£1.49), I already knew that I wasn't a fan of coconut water but I had hoped that the lime might overpower that flavour a little bit, I was wrong. I really did not enjoy this at all, I took one tiny sip and knew I'd already had enough! If you like coconut water though I think you'd really enjoy this. 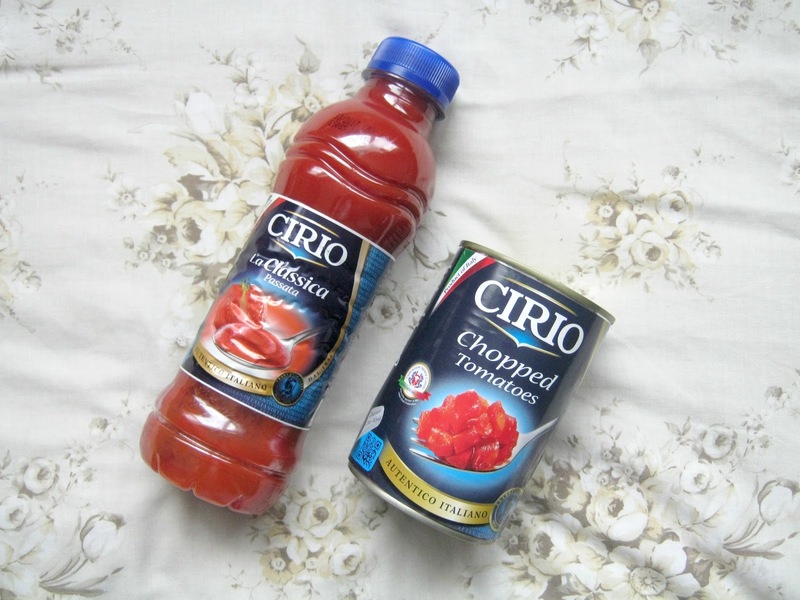 These Cirio products might not be the most exciting things in the world but they were definitely an added bonus! My Mum said she'd spotted the brand in Asda quite a few times and they were reasonably priced so I popped them in the cupboard for us to make a spagbol with at some point. We still haven't got around to making it yet but I think these will be perfect for that. Finally we are nearing the end! 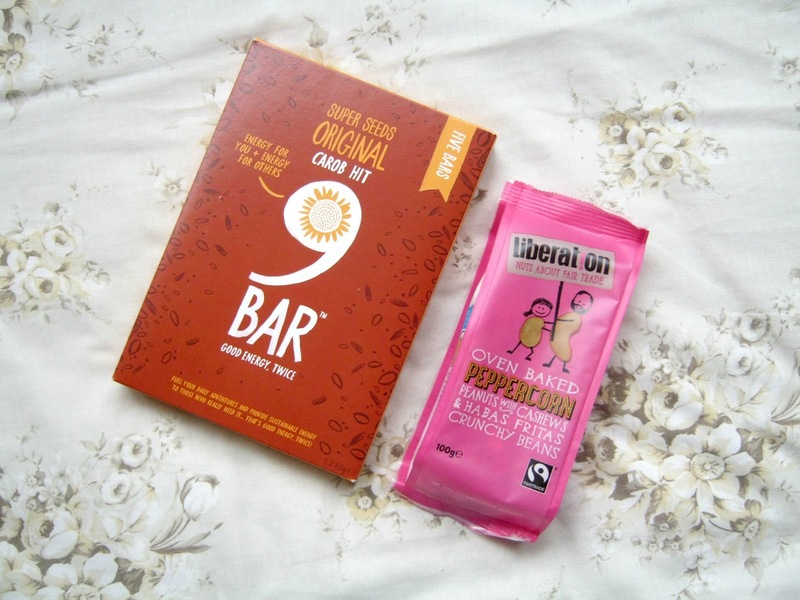 I'll end on a good note so let's talk about these Original Carob 9Bars (£2.49) first. I've never been a massive fan of 'health bar's before apart from the Nakd ones so I was interested to see whether I would enjoy these or not. Unfortunately for me though there were just too many seeds in the bar, it made it quite difficult to eat! My family however have really enjoyed munching their way through them so perhaps it is just me being fussy! Finally we have this Liberation Foods Nut Mix (£2), I found this to be a great evening snack that you could graze your way through whilst watching TV. I can't say I'll be picking them up next time I'm out and about but they were a pleasant addition! So, that's my October Degustabox! I won't be getting one of these boxes every month, for me they are a nice way of trying new foods and a bit of a treat that I'll enjoy more if I get a box less regularly. 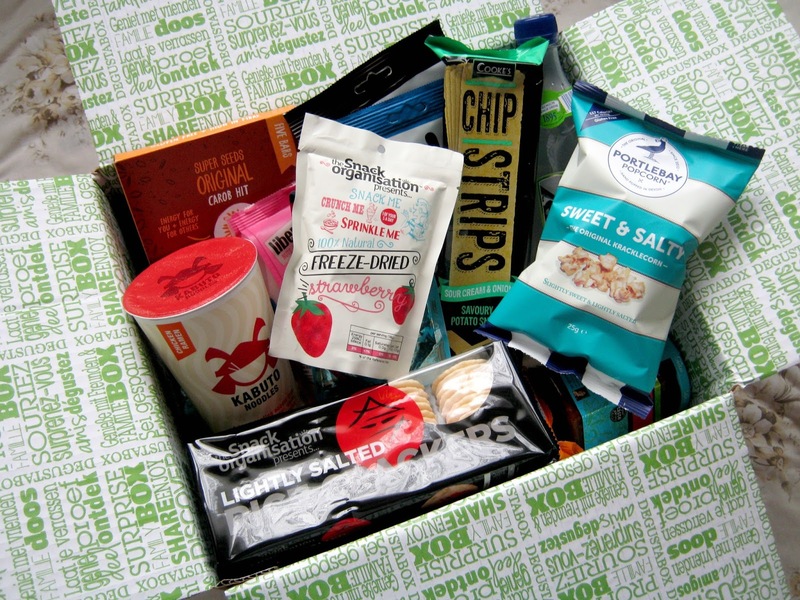 If you want to try a Degustabox for yourself then head over to the website to find out more info! They are usually £12.99 but I got some money off because it was my first box so I'm sure you will too. Let me know what you thought of the October box if you got it! I always hear so much about these boxes but absolutely love your review of it. I may have to go and check it out properly now. Plus it is 4am and I now want crisps. Thanks Kellie! Plus 4am + crisps can never be a bad idea surely?